This card has just gotten more and more OP as years have gone by. Frozen Throne gave us the ability to Rez the big boy in the form of DK guldan. K&K not only gave us another way to cheat him in, but also gave us Voidlord, which got huge with Malganis and then exploded into multiple buffed demons. On top of that, cube came along, and having multiple malganis's is usually game ending. 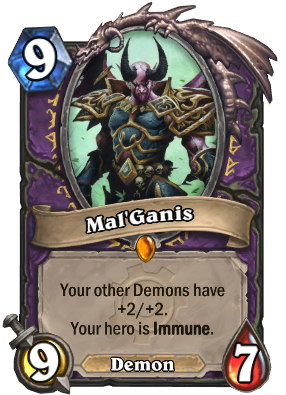 It's very clear that when Blizzard makes cards that care about demons, they don't bother to take a look at Malganis. Which might end up hurting the format later down the line, but in the meantime I'll be making insane boards with this dude. I always play standard, so RIP Mal ganis. I remember making this card and getting it off a pack 4 days later. Literally the best Warlock card imo. True OG card. I wonder if we will ever get an card with just one of his effect and if it will see play. Such a great card. I wish he would get rotated into the Classic set. He's that good. Crafted this bad boy a couple days ago. One of the best ways you can spend 1600 dust. This card just keeps getting better and better with every expansion. Turns out a board full of Voidwalkers is a big problem when they're 3/5's and your opponent already used all of their board clears. It might be a stretch, given he came out way back in GvG but Blizzard has slipped a few lines in quietly over the years. I would test, but I don't have him nor the dust to craft him. tried it, took 7 games to pull it off. no special flavor text though. Wow, thanks for going out of your way to test it. Consider my curiosity sated. Today got him from Kabal Courier in arena. This is madness. Even without daemons, 9 mana 9/7 is very strong. Wild is not bad at all before ranks 10 or 5, it in fact has a lot more variety! If you aren't planning to grind to legend, there are few Secret Paladins and not even that many Doctor Booms!